The quarterback made it clear he still is enthusiastic about playing at age 38. Eli Manning has yet to say anything publicly about the Giants’ trade of Odell Beckham Jr. to the Browns — or about anything else Giants-related since the end of last season. But on Wednesday he did offer an opinion that is sure to generate some wistfulness among fans who were less-than-pleased to see Beckham go. Manning answered questions from emcee Max Gomez as part of an NYIT Center for Sports Medicine/Head Injury Association panel discussion in Woodbury on head injury awareness, one of which was this: Who is the most gifted athlete you ever played with? 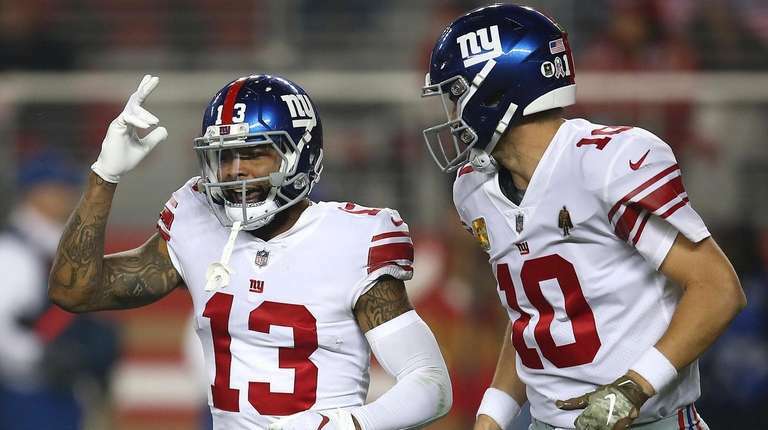 The Giants chose to move on without Beckham anyway, and to move on with Manning, who is entering the final year of his contract and soon is likely to have a new teammate in the form of a rookie quarterback/presumed successor. Manning was not asked about that on Wednesday, or about his meeting with general manager Dave Gettleman after the season to discuss the team’s plans at the position. He left after about a half-hour Q&A without being made available to reporters. Other panelists included Curtis Martin, Harry Carson, Wesley Walker, Gerry Cooney and Randy Cross. Manning made it clear he still is enthusiastic about playing at age 38. Manning, who is entering his 16th season, praised the NFL for the rules it has instituted to protect players in general, and their heads in particular. He said players are far more aware now than when he began of the dangers of concussions, and that equipment continues to improve. He said in his 15 seasons he has tried 10 different helmet designs and manufacturers. Other rules have helped, too, such as the clarification of what is or is not a catch. Manning said he always has advised his receivers, “Guys, when you catch it just kind of hold onto it. You don’t have to celebrate immediately after a catch, especially if it’s a first down in the first quarter of the game. We don’t need a full dance after a first-down catch. Manning has three daughters, and earlier this year welcomed his first son. Will he allow him to play football? “My answer is 100 percent I’ll let him play football if he wants to play, or any sport,” he said. He said football has been good to his family, and he added that while his father, Archie, is beginning to suffer the physical repercussions of his NFL playing career, his mind remains sharp. Asked which non-family members he most would like to have in a foxhole with him, Manning named former teammates Ahmad Bradshaw, Brandon Jacobs and Chris Snee, all of whom he said he would like to have on his side in a fight. “You’d have to kill 'em to get them to stop,” he said.